April | 2011 | What about this? 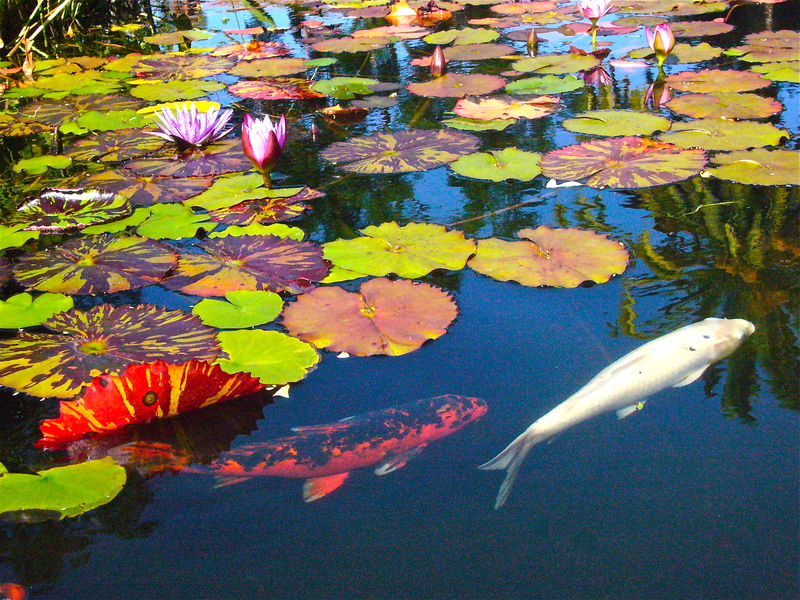 Koi fish swim lazily through the pool as dark waters envelope them. Small periscopes of water lilies jut above the water and rest on their large floating leaves. Shimmering reflections of palm trees create a disorienting effect. And busy tourists walk by this beautiful sight without as much as a glance. Their loss, my gain. Have the yearn to learn, but can’t afford costly classes? Take a peak at this article about 12 Dozen Places To Educate Yourself Online For Free and expand your horizons by taking a class or two. Major educational resources, as well as, well-known universities, such as UCLA, Harvard, Carnegie Mellon, and Yale offer these wonderful learning opportunities. Green tea is rich in plant compounds that help protect laboratory animals from cancer and other diseases. But the jury is still out over whether it helps protect humans against cancer, strokes, or cognitive decline. If you want the full range of potentially beneficial compounds in green tea, drink it freshly brewed and often. If you drink bottled tea, look for one made primarily from brewed green tea, not tea extracts or concentrate. Creating photo mosaics requires time, patience, and an eye for subtle color differences. This version of Van Gogh’s Starry Night was constructed from 210,000 tiny photographs. Zoom into the piece and see the individual photos that make up this amazing project! #4 – Raindrops Keep Falling! Another week, another game! Here’s a game that could help strengthen your mental calculations and quantitative reasoning. As each raindrop falls, answer the equation inside the drop. Easy in the beginning, but watch out for the downpours! Each morning when I open my eyes I say to myself: I, not events, have the power to make me happy or unhappy today. I can choose which it shall be. Yesterday is dead, tomorrow hasn’t arrived yet. I have just one day, today, and I’m going to be happy in it. “What can I bring?” I asked my friend as we planned a surprise birthday party for another one of our friends. “Can you bring rice?” she said. “Sure, no problem!” I replied. After all, rice was an easy dish for this Asian gal to prepare. But then my friend added, “Can you bring cilantro and lime rice like they serve at Chipotle?” While trying to remember if I’d ever tasted Chipotle’s rice before, I uttered, “Ohhh, okay . . . !” My friend cheerfully said, “Great!” and I mumbled back, “Yeah, great . . . .” and headed off to find the nearest Chipotle restaurant. That conversation began my quest for a cilantro and lime rice recipe. Luckily, I found several online and I diligently read through them all. After experimenting with a few recipes, I ultimately found one that needed only a few minor tweaks and that tasted really good. Wanting to simplify the recipe, I cooked the rice in my rice cooker instead of a saucepan and was delighted with the results! The light and refreshing flavor combination of cilantro and lime just can’t be beat and makes this rice dish a perfect accompaniment for grilled meats and seafood. Particularly, it’s a great complement to any of your favorite Mexican entrees. Serve this easy rice dish at your upcoming Cinco de Mayo celebration and be prepared to share the recipe with your guests – you’ll be asked for it! 1. Add the oil and butter in a saucepan and heat on low until butter has melted. Add the garlic and rice (uncooked) to the oil mixture and saute for two minutes over medium heat, stirring frequently and being careful that the garlic does not burn. 2. In a mixing bowl stir to combine the chicken broth, salt, and lime juice. 3. 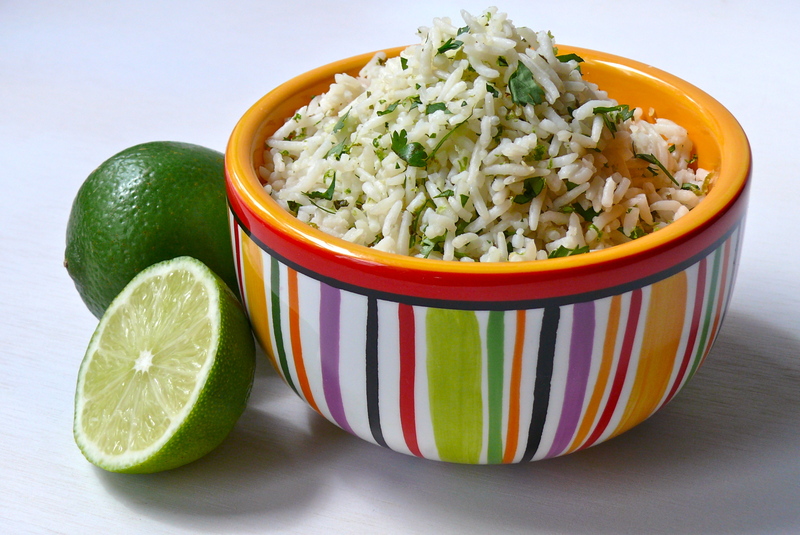 When rice is cooked, add the lime zest and chopped cilantro and stir gently to mix. Serve immediately. 1. It is easiest to use a rice cooker – both to cook and keep the rice warm. No worries, though, if you don’t have a rice cooker, this delicious rice can be made in a saucepan. See above instructions. 2. I rarely add the full teaspoon of salt that is called for in the recipe. Depending on the sodium level of your chicken broth, you may need to adjust the amount of salt you add. I use low-sodium chicken broth and find that 1/2 teaspoon is enough for my taste buds even when I make a double batch. 2. After adding the lime zest and the chopped cilantro to the rice, taste and then adjust the seasonings. I often add more lime juice at this point and most of the time will not add the full amount of cilantro. 3. It’s better to add the zest and the cilantro as close to serving time as possible, so that their colors remain vivid and fresh – inevitably their colors will darken as they heat up. Today is my Mom’s birthday and I’m wishing her many more: sunny days to warm the freckles on her face, happy memories to fill her heart, big and little reasons to celebrate, moments to laugh with the grandkids, cherished years with my dad, enjoyable times with her friends, hugs and kisses from her children, trays of lasagna and enchiladas, and people to love and be loved by. Happy Birthday, Mom! #1 – Why I Rule! Need a little pep talk or just need a daily affirmation or inspiration? It’s as easy as going to Tell Me Why I Rule and clicking on the button. I clicked on the button and this came up: You have learned that everyday may not be good, but there’s something good in every day. A great reminder for all of us! Last week I linked to a computer game that tested reaction time. This week I offer a link to a game that tests your concentration. It’s a shell game – you must keep an eye on which coconut shell is hiding the rock. If you appreciate fine art or even if you don’t, you will definitely be impressed with this painting. The amazing details of a painting done by artist Giovanni Paolo Pannini in 1757 are revealed by zooming into the piece frame-by-frame. Would you be able to survive if you were lost at sea or lost in the snow? The site Survive Nature offers survival tips for for six different scenarios. Not being the outdoor-type, I cannot vouch for the accuracy of these tips. I don’t know about you, though, but I’m storing the information in the back of my head! #5 – To Be Beautiful . 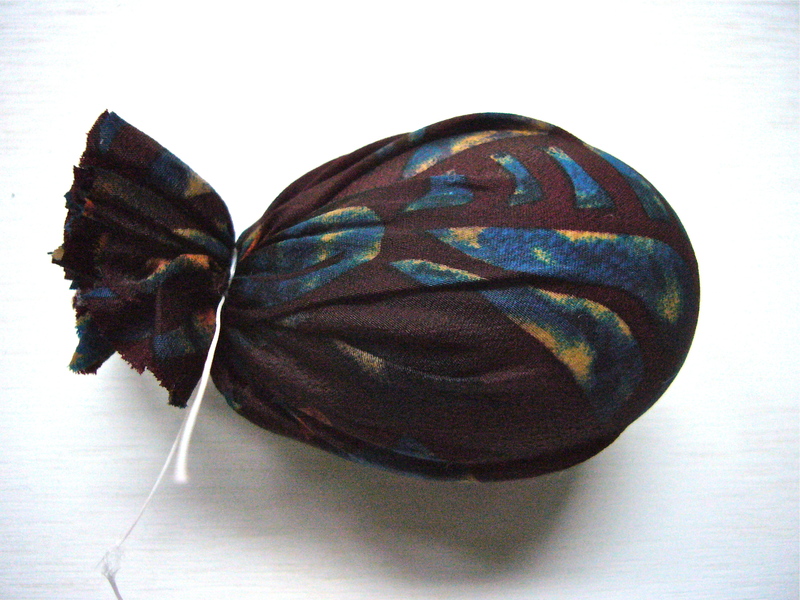 . .
Unwrapping a tied-dyed egg is a little like opening a present – you don’t know what you’re going to get! 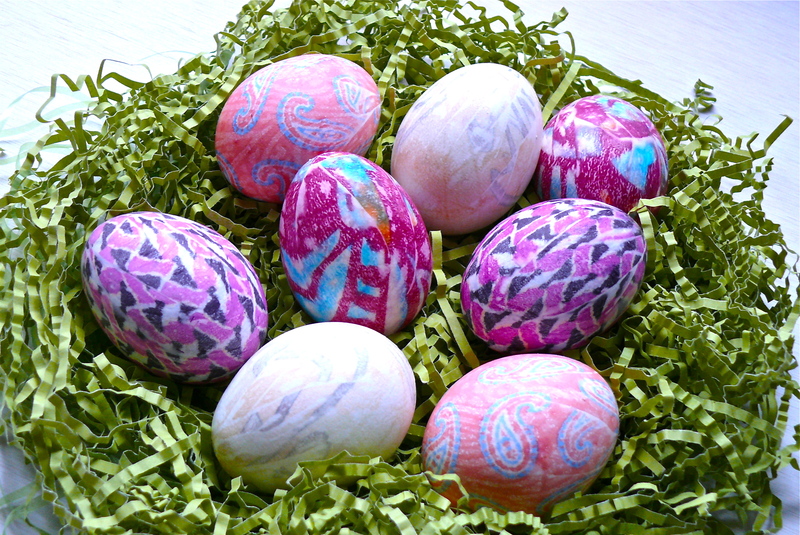 This fun technique for dyeing eggs uses men’s silk ties as the color source, so these eggs are truly TIE-dyed! If the men in your life will not relinquish any of their ties for this project, just purchase some at your nearest thrift store. I found this technique on Mommy Knows and thought – of course a clever mom would know about this no-mess technique for dyeing Easter eggs! This is a great project for all ages! 1. 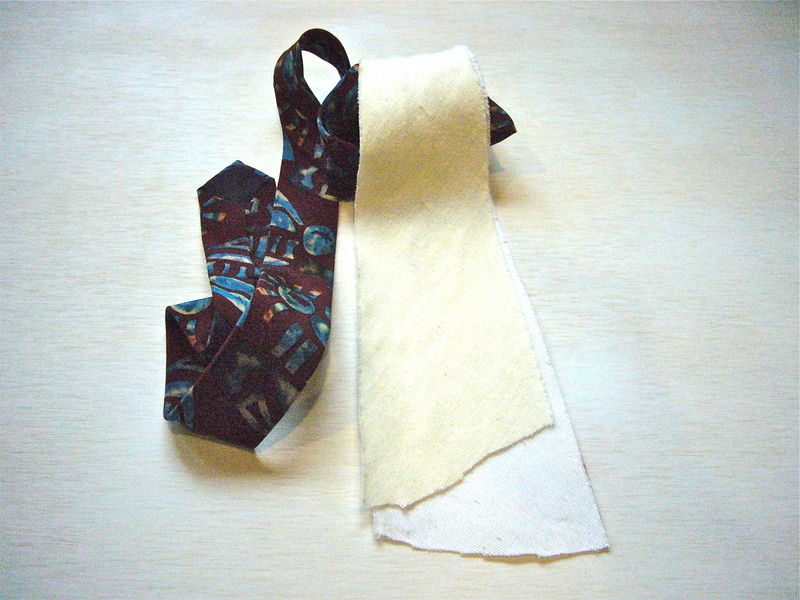 Collect old ties and with a pair of scissors, cut open the back seams of the ties. 2. Cut out the triangular pieces of decorative lining and discard. 3. Cut out the white lining and save. 4. Cut out a piece of fabric large enough to wrap around the egg, wet it, wrap it around the egg, and gather it at the top. Tie top with string. 5. 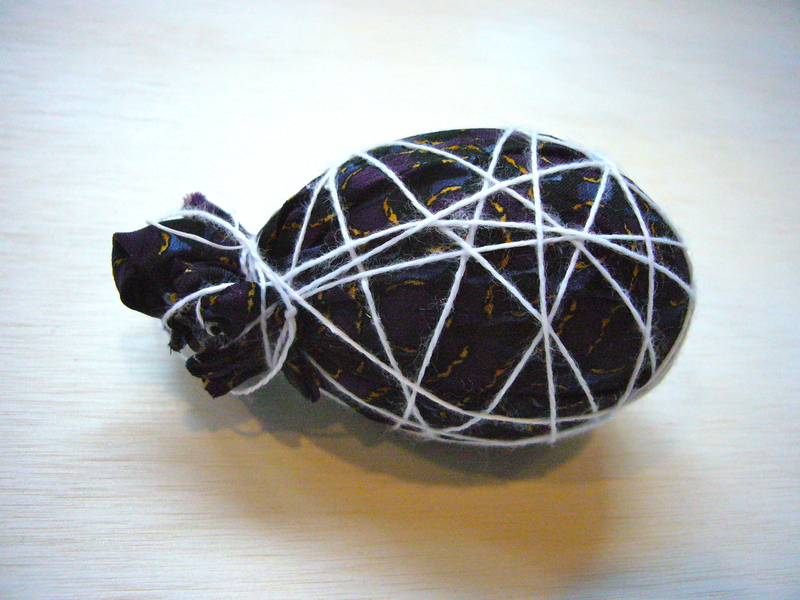 To keep fabric in close contact with the egg shell, wrap string all around the egg. 6. 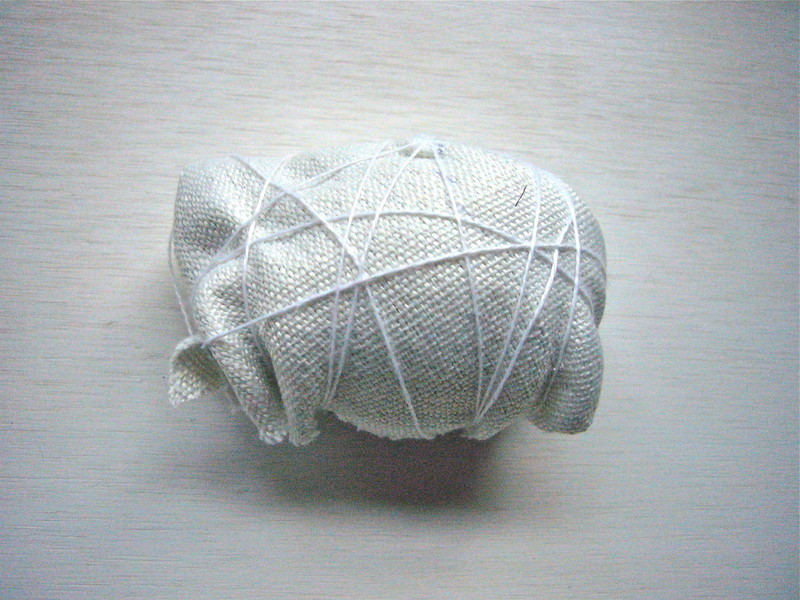 Cut a piece of the white lining fabric and wrap the egg in it and then tie it with string. 7. Put the eggs in a pot of cold water and 1/4 cup vinegar and then cook for 20 minutes. 8. After eggs cool, enjoy unwrapping your creations! 1. A good looking tie does not necessarily translate to a good looking egg and, likewise, an ugly tie does not make an ugly egg. 2. 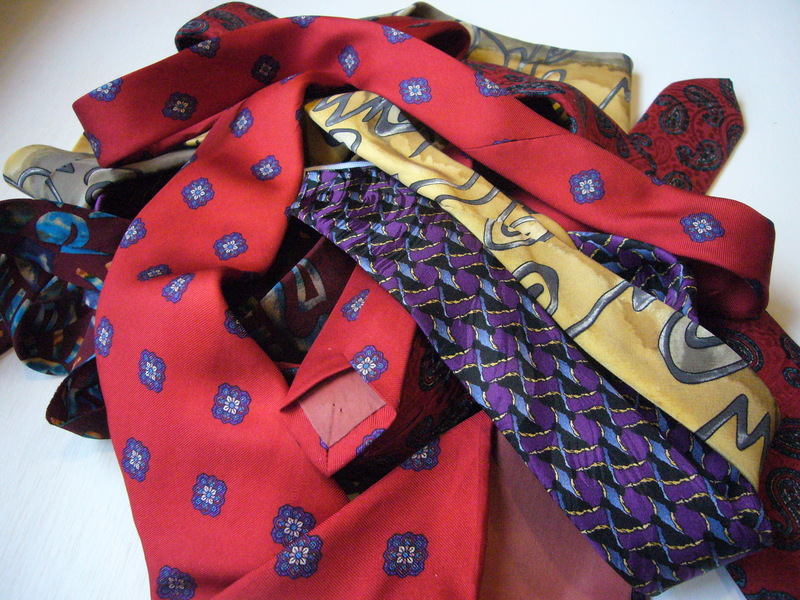 I found that the less traditionally-patterned Jerry Garcia ties are great for this project. 3. Pale-colored ties did not turn out as well. 4. 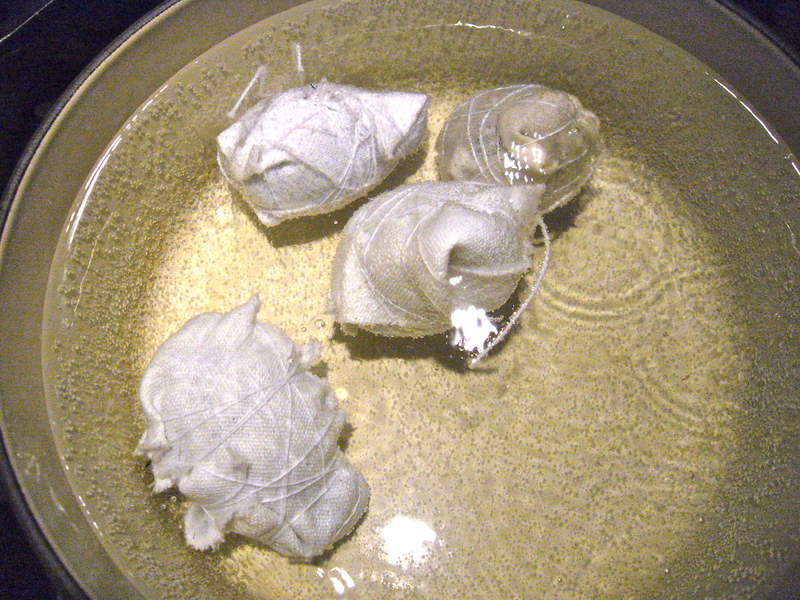 I cooked the pale-colored fabrics in a separate pot from the strong-colored fabrics, so the color would not transfer. 5. I didn’t have time to experiment, but the original instructions suggested wrapping strips of fabric around the eggs to create different effects. Whether extraordinary or mundane, once a moment in life has passed, it’s gone forever. There’s no getting it back, or is there? When I look at the photo of me taken five decades ago, I cannot give you the exact date it was taken on, but I can give you details about the exact moment – the time of day, the location, the sights and smells, the clothes I wore that day, and even my mood. My parent’s grocery store had closed for the evening and the lights were dimmed. I had completed my chores at the store and was waiting to go home. 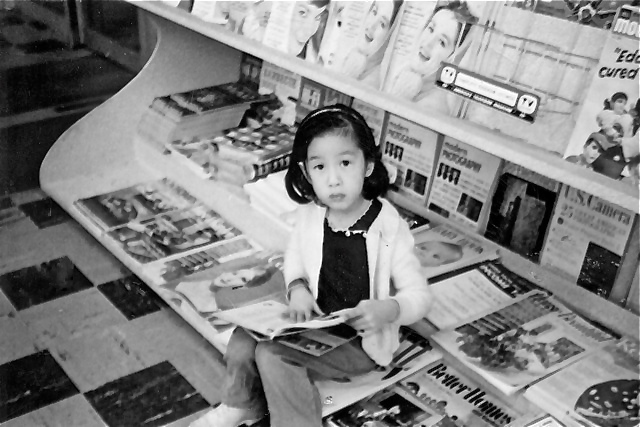 Grabbing a handful of comic books off the round revolving rack, I plopped down on the magazine display and was quickly absorbed in the lives of Richie Rich and Archie, Betty and Veronica. I heard a voice call out my name and looked up to see Uncle Edgar, one of my adopted “uncles” and a longtime employee of the store, snap the photo. Although much time has passed, the memories of that innocent moment rush back and somehow rejuvenate me. I discovered these photos taken by photographer Jason Lee of his two adorable daughters. They are so cute (both his daughters and the photos) that I had to share them with you! These photos sure beat the one taken of me! You can see more of Jason’s photos here. #2 – How Fast Are Your Reactions? Well, mine were not as fast as I thought they were! Although I did manage to graduate from “Sluggish snail” to “Ambling armadillo” in a few tries, I’m not going to stop there. This old body is aiming for “Turbo-charged cheetah.” Test your reaction speed by hitting the button when you see a sheep making a mad dash for freedom. Easy, right? Just don’t blink! We live in an amazing country, but each state in the nation has its strengths and its weaknesses. Check out these “infographs” and learn a different kind of geography lesson. Try to capture a moment this weekend! In a disarray of discarded plants and flowerpots, a neglected, but tall and proud-looking amaryllis caught my eye. Surprised by the sight, my heart rapidly filled with emotion – first sadness and then happiness. 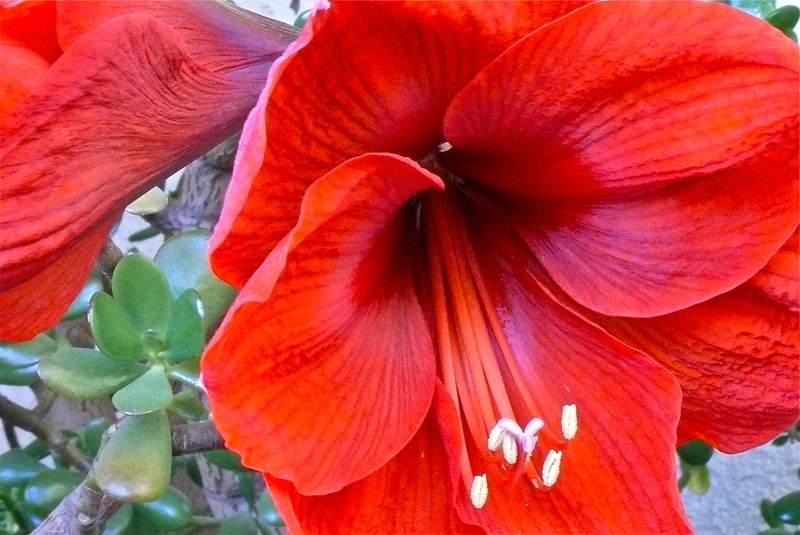 With its sturdy, solitary stalk and two huge Christmas-red blooms, this plant reminded me of a dear friend I once had. Her name was Martha, but I knew her as Marty. About ten years ago my daughter and I volunteered to paint fingernails at an assisted-living care center for senior citizens. Walking through those doors that day we could not know how our lives would change. It was fate. Of all the women in the room we could have helped, my daughter chose the feisty, diabetic, and wheelchair-bound Marty. For six years, we regularly visited Marty at the center. In an attempt to make her life better, we brought her books to read and movies to watch, as well as holiday decorations to bring cheer to her room. And whenever we went on vacation, we made sure to bring back a souvenir for our friend. As many a great time we shared with her, we also endured difficult ones. Witnessing her decline from an opinionated and independent woman to a bedridden and silent one challenged our spirits, but never our commitment to her. Towards the end, we braced ourselves whenever we entered Marty’s room. One thing was for sure, though, no matter what physical condition she was in, Marty’s bright blue eyes always lit up when she saw our faces and we, in turn, always tried to smile, covering up any alarm we might have at seeing her situation. Four years ago, in the month of November, the phone call came – Marty was gone. After hanging up the phone, I looked at the potted amaryllis bulb that sat on my kitchen counter. It was to have been Marty’s Christmas gift and my daughter and I had been eager to see the expression on Marty’s face when we presented it to her. Sadly, I picked up the plant and carried it outside and placed it amongst a pile of old flowerpots. I stood there remembering an earlier Christmas that Marty received an amaryllis from her son and how she spent the following months marveling at it. After the giant blooms faded, she had asked me to take the bulb home and replant it for her. Regretfully, I never had the opportunity to do that, because the plant, pot and all, disappeared from her room. That’s when my daughter and I decided we’d buy her a new one – one that she’ll never see. 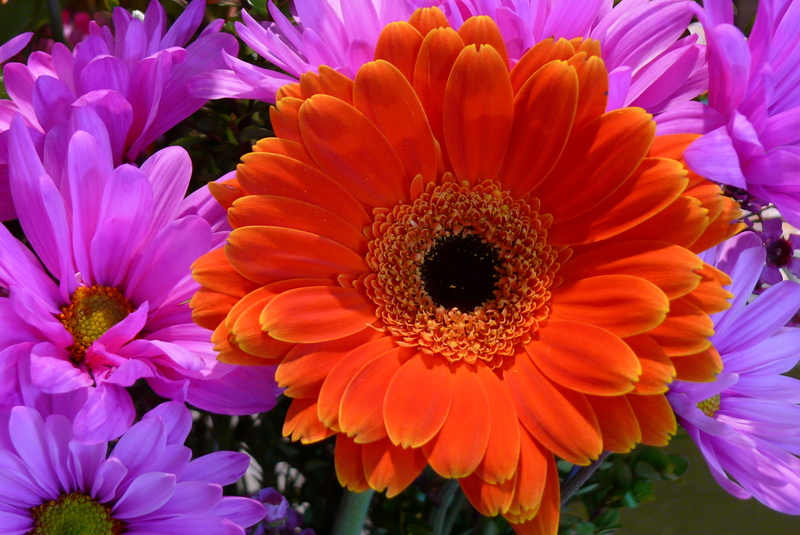 Bright, eye-catching circles of color made a pleasing display on my family room floor. 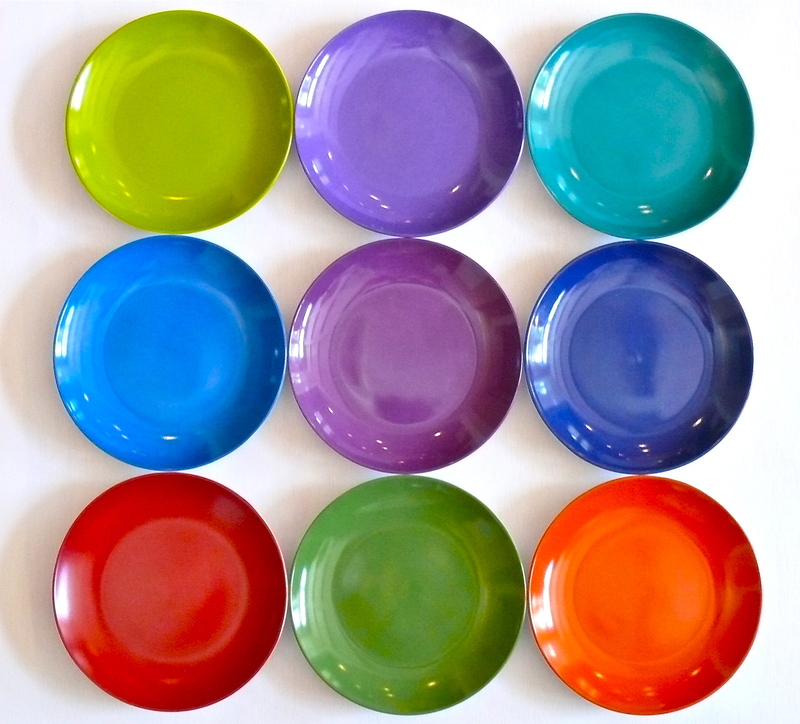 The circles were really ceramic plates that I laid out to photograph for a color reference chart. Reminding me of a giant keypad, I resisted the urge to push these buttons! It happens. Someone pushes your buttons or gets your goat and now you’re annoyed and bent out of shape. Here’s an article that offers six ways to cope when that happens. Negative events often afford us the best opportunities to glimpse into ourselves and learn some life lessons. Pushing buttons with your fingertips and then touching your face is a good way to spread germs. Sharing personal items is another way. Dr. Oz has some obvious and some surprising recommendations about items that should not be shared. For example, did you know that “keyboards have as many germs as your toilet”? Ewww. . . ! Play with shapes, colors, lines and angles when you create your own computer kaleidoscope on this site. Oh, how I love creative distractions! #4 – To Attach or Link? Occasionally, I’ll see something on the internet that I want to share with someone and instead of sending the person a link to that site, I’ll convert it into a PDF first and then send it as an attachment, which can be saved, printed and replicated regardless if the website changes. Here’s a site that converts webpages into PDF documents. Just fill in the URL and click “convert.” It’s as easy as that, plus it’s free!